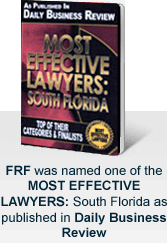 Friedman, Rodman & Frank, P.A., represents personal injury victims in litigation in courts throughout Dade, Broward, Palm Beach, Collier and Lee Counties. Many of the cases we handle involve failure of property owners or managers to repair property they knew was defective. We have received favorable results for people who were hurt by the defective and dangerous conditions that existed on the property, helping to cover victims' past and future medical bills, lost wages, loss of future earnings, past and future pain, suffering and rehabilitative care. We handle cases involving defective or dangerous roofs, stairways, railings and decks. In many of these matters, landlords and property owners knew of the danger but failed to warn others about it. Many put off repairs until the worst happened: serious personal injury and oftentimes even death. Successful personal injury claims can help victims recover thousands of dollars in damages, but the greatest value in litigation is often found in preventing the same harm from happening to others in the future. Lawsuits send a clear message to property owners: Putting others' safety in jeopardy is not acceptable. Often lawsuits force property owners and managers to change policies and procedures so that the same harm will not happen to others in the future. To discuss your options with an experienced Miami premises liability lawyer, call us at 305-448-8585 or toll free at 877-448-8585 or contact us online. Consultations are free and confidential. We are available 24 hours a day, seven days a week.